If you haven't already done so please read Part I which establishes how the calculations were done for this particular piece. In the haste to get Part I out I neglected to point out one key weakness of the calculation. 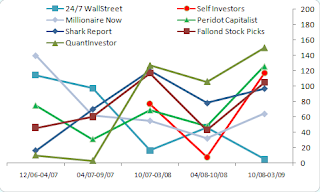 Because an average score for each time period is used it is possible for a blogger to be 'in sync' with the market but to do so from a diametrically opposed standpoint; for example, if the S&P was bullish for the first five polls and bearish for the following five its average score is zero. Over the same period if a blogger was bearish for the first five polls and bullish for the last five (s)he would have the same average score of zero. This discrepancy can be solved using an accuracy measure for each call, as I have done in the past. I will be integrating this data into Part III of this article. 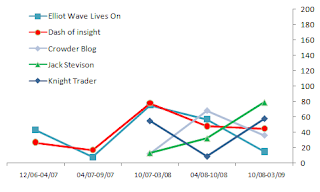 But in this part I will be expanding on blogger sentiment from the net average score for all time periods combined into blogger sentiment for each of the five time periods. A 'time period' contains the results of 21-22 TickerSense Polls. The score ranges from 0-200; a score of 0 represents Blogger's sentiment in tune with the performance of the S&P over 30-days post call (but it does not relate direct call-to-call accuracy); the higher the score the more incorrect a particular bloggers' opinion was on future S&P performance compared to actual S&P performance. The first group of bloggers, Wishing Wealth, Traders-Talk, Controlled Greed and Information Arbitrage all had a high affinity to future S&P's moves. 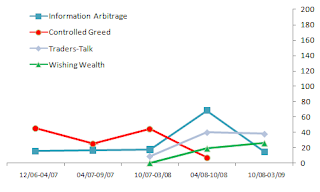 Wishing Wealth opinion was closest to that of S&P performance but it was Information Arbitrage which performed strongest over all five periods. His only period of weaknes was between April and October 2008 in part because he participated in only four polls during this period. The next batch of bloggers were more mixed in performance. 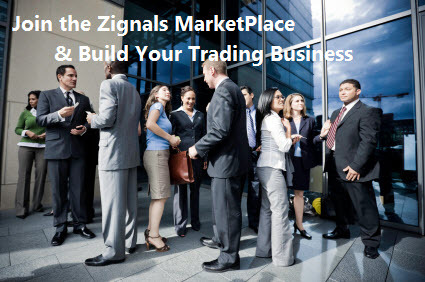 Elliot Wave Lives On and Dash of Insight both had similar patterns of opinion with Elliot Wave Lives On more in tune with the market based on most recent data. The next batch of bloggers were more variable in their opinion. Most improved was 24/7 Wall Street followed by Millionaire Now. Drifting out were QuantInvestor, Shark Report and Peridot Capitalist. 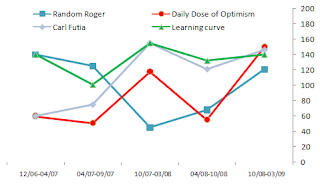 The outliers had their moments with LearningCurve the most consistent 'off' the market. The true story won't be known until accuracy is considered as part of the equation but the calls of Information Arbitrage are one to follow closely. He was bearish for S&P performance over the next 30 days. Wishing Wealth was also bearish.